I am a member of the Collective Bias® Social Fabric® Community. This #EatMoreBites shop has been compensated as part of a social shopper amplification for #CollectiveBias and its advertiser. I have been making Desserts with pretzels and chocolate since I started this blog, so this is what inspired these Three irresistible Chocolate Easter Dessert Ideas. Really only one chocolate dessert ideas is specific to Easter and the other chocolate desserts can be made all year round. More importantly are made easily with the introduction of Mars Milky Way Simple Caramel Bites. Anytime I don’t have to unwrap a candy, that is a bonus. Don’t be too surprised if you have trouble finding these delicious chocolate caramel gems. They are brand new and I was finally able to find them at our Walmart Store. They were not in the candy aisle but in a separate cardboard display in the Easter Candy Aisle. After I grabbed two bags of the Milky Way Bites, there were not many left. 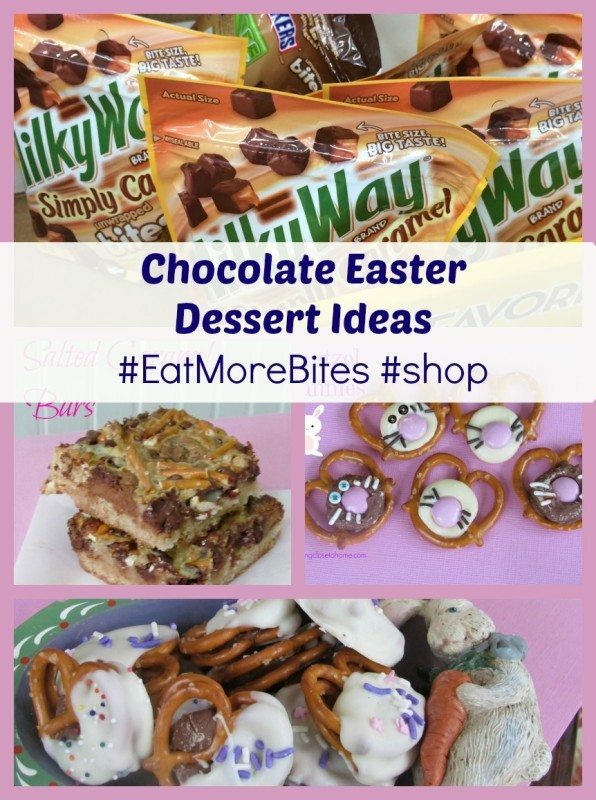 Now back to what you are really here for, a few yummy Chocolate Easter Dessert Ideas. 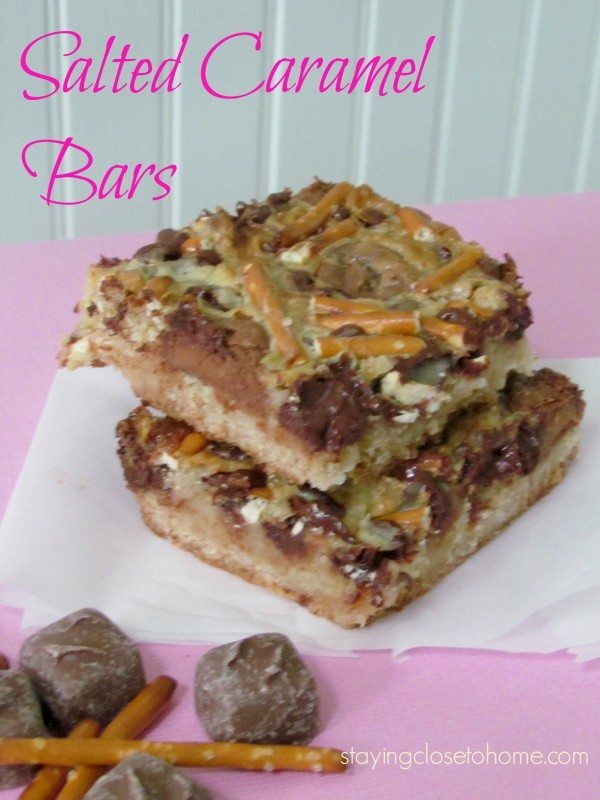 While browsing Pinterest I found this Magic Bar recipe and thought how wonderful would they be with the addition of the Milky Way Simply Caramel Bites and Pretzels. I named this new adaptation Salted Caramel Bars. Magic is not the right word, more like Heaven bars. If it was not for Lent, I may have hidden away the entire pan for myself. Again this is a super simple dessert recipe as well. We started with a package of sugar cookie mix as the bottom layer. I wish I had put a layer of tin foil down first. Next time. Next add about 3/4 of the bag of Milkway Simple Caramel Bites, spreading them out evenly. Plus 1 cup of semi sweet chocolate chips. Now what makes them “magic” bars. Add a can of condensed milk over this chocolate combo. 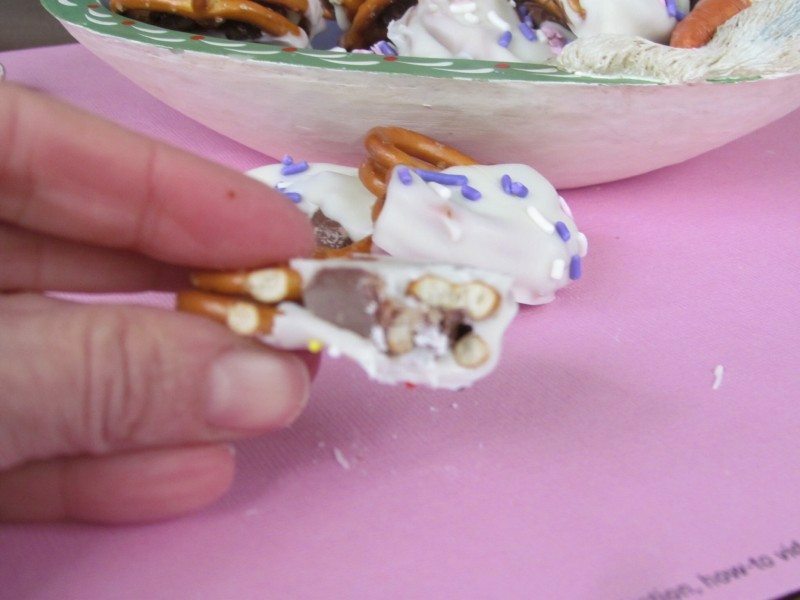 Sprinkle the top of the pan with about 1 cup of broken pretzel sticks and bake. To get an evenly browned pan, I would suggest rotating the pan half way during the bake time. Now for the Pretzel treats. This was actually my original recipe idea but I did not love now it turned out so we get a bonus treat. 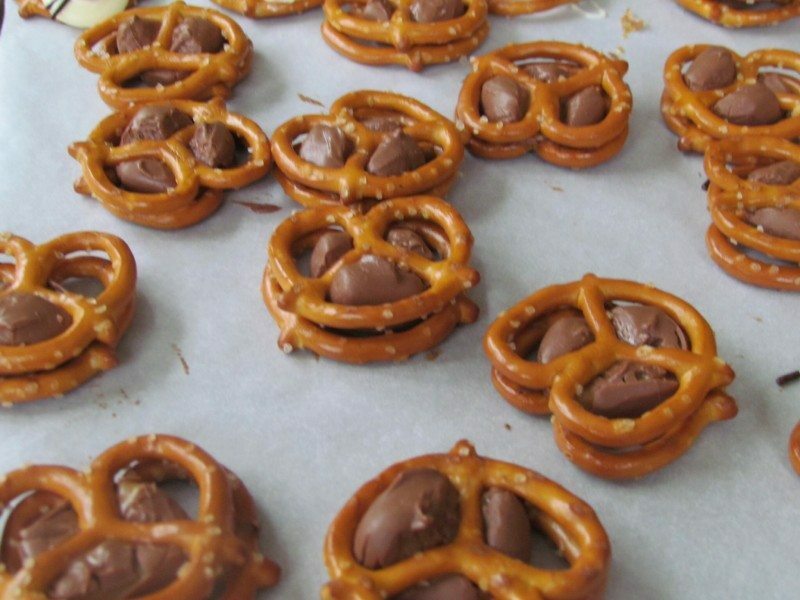 Like so many chocolate pretzel treats of our past we start with a sheet pan, a pretzel and a piece of chocolate. 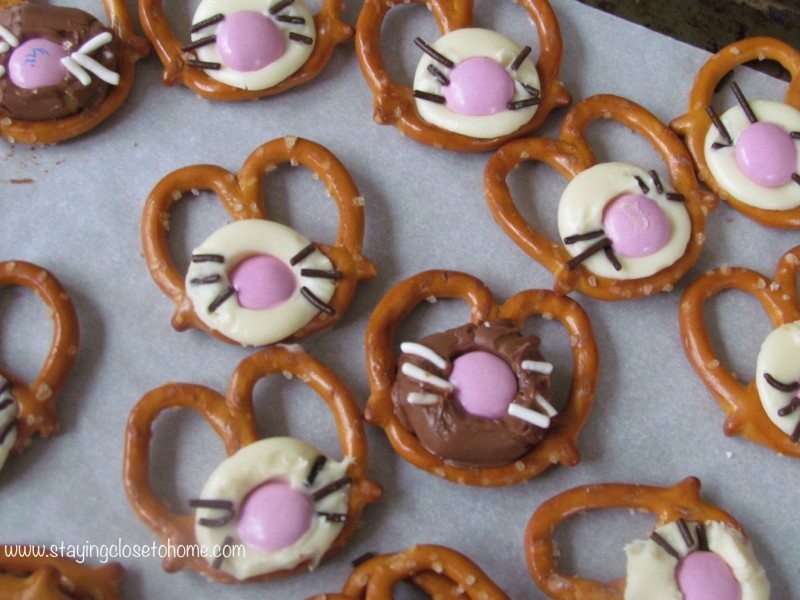 For the Bunnies, simply add a pink candy coated chocolate and chocolate sprinkles. You can use a tweezers for the sprinkles. I could not resist making both Brown and White bunnies. 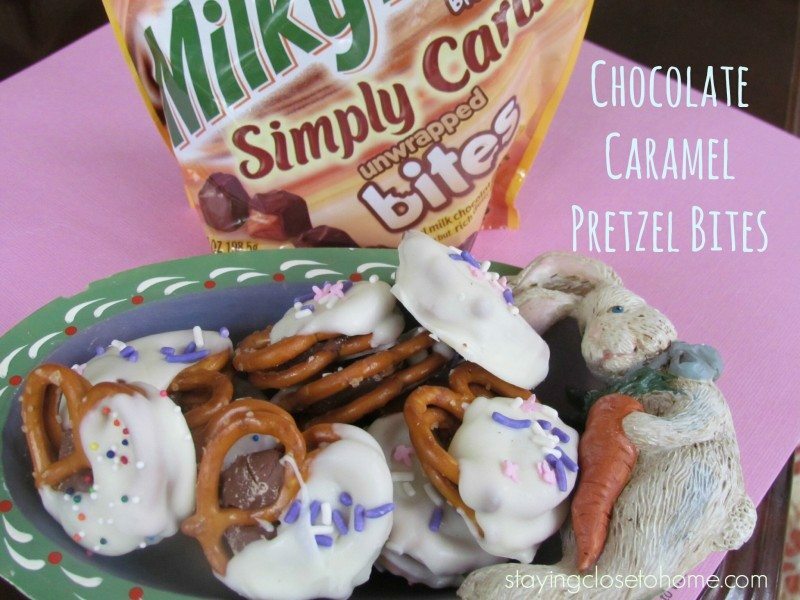 Now the original chocolate Easter Dessert I had planned with these sweet Milky Way Simply Caramel Bites, Chocolate Pretzel Bites. 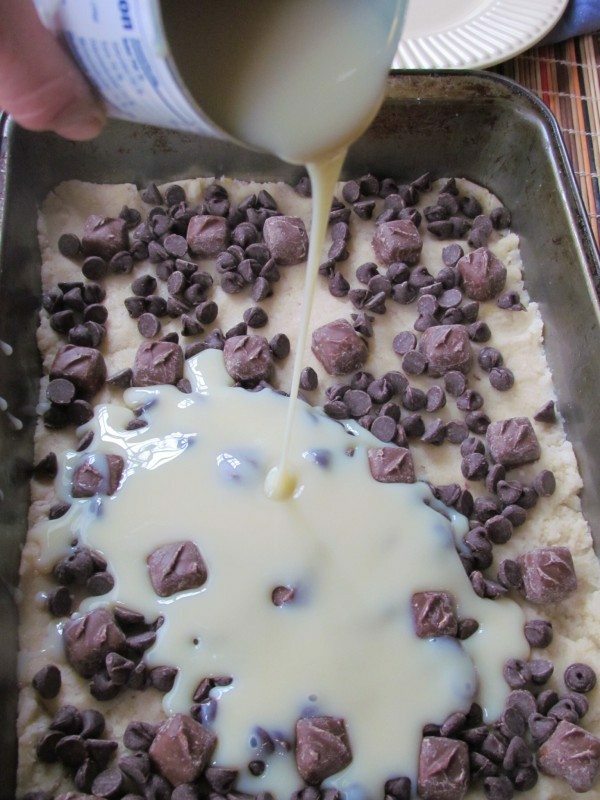 Following steps above melt the Milky Way Bites in the oven until softened. Top with another pretzel, fitting in the same direction. 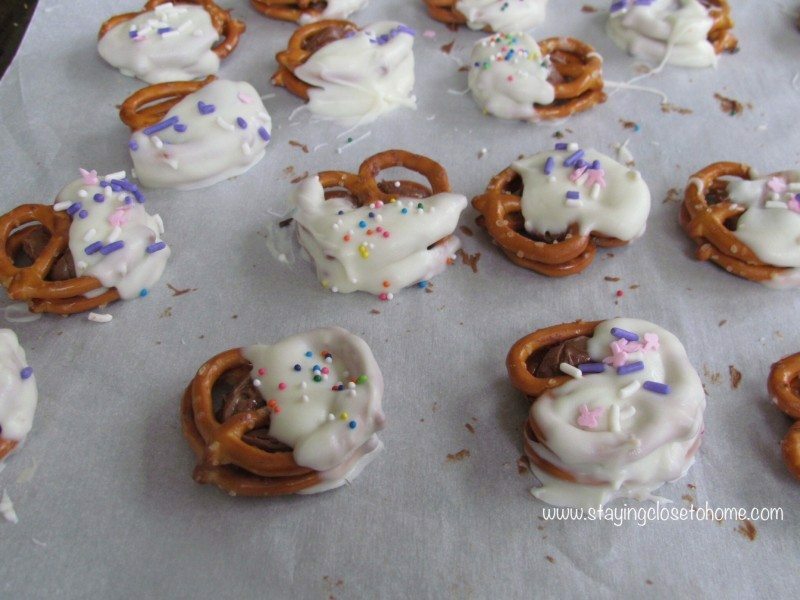 Once cooled, dip the pretzel half way in white chocolate and add sprinkles if you desire. (you can customize these for any occasion) Cool completely. Have I tempted you to try these New Mars Bites? 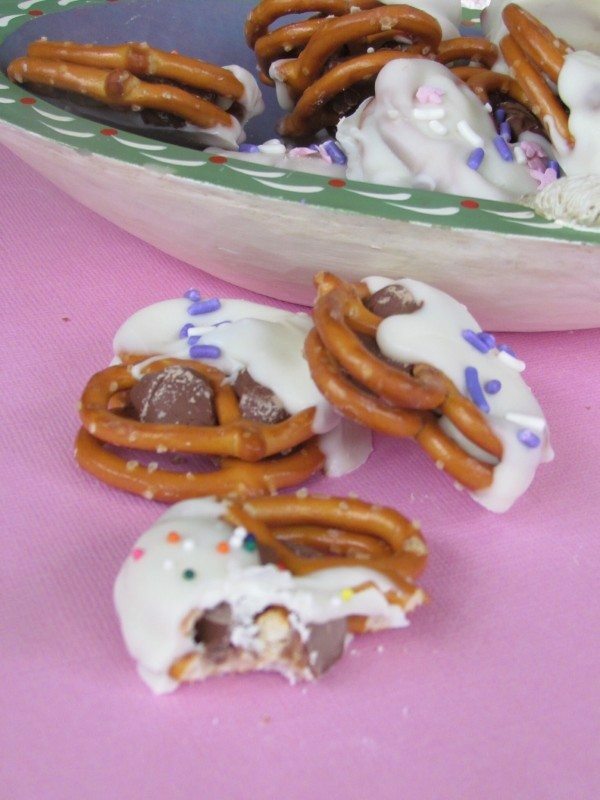 Which of the Three irresistible Pretzel & Chocolate Easter Dessert Ideas did you like best? Preheat your oven to 375. Spray a 9 by 13 pan with cooking spray and set aside. Or line it with nonstick foil. Make the cookie mix per the package instructions and press it into the bottom of the pan. Allow to cool completely and then cut into squares. Yummy. anything caramel and I am in! 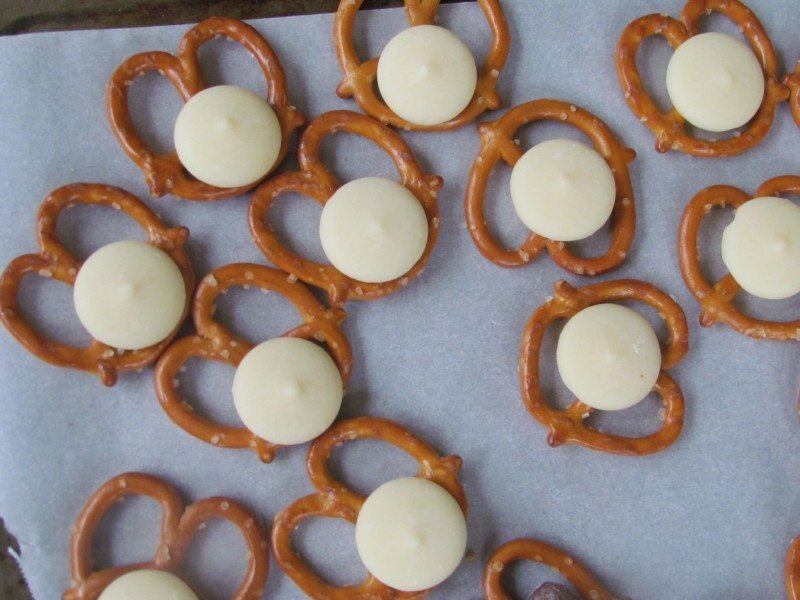 cute ideas for pretzels too. Great ideas -Ill take 5 of each please! What great little Easter Treats, these are awesome! Happy St. Patrick’s Day and thank you so much for sharing your awesome post with Full Plate Thursday. Have a great week and come back soon! 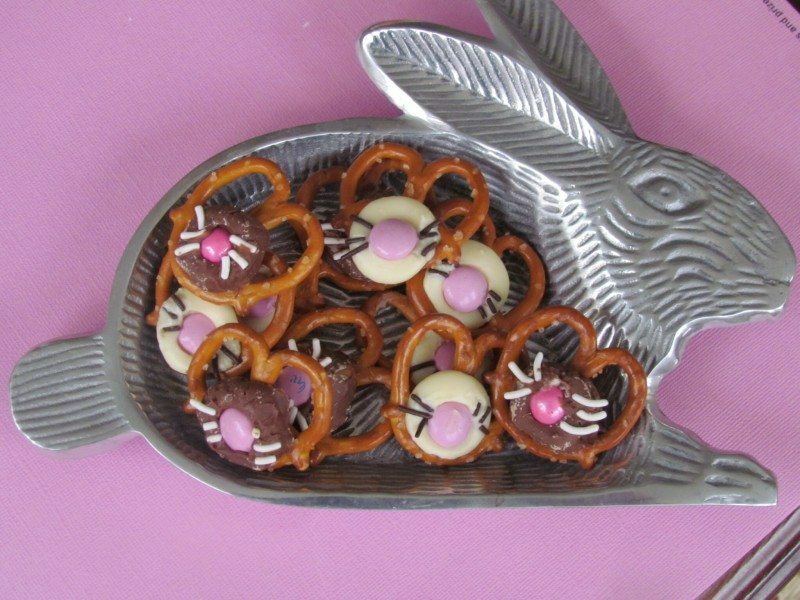 The Pretzel Bunnies are so cute! You know I love bunnies! So cute! 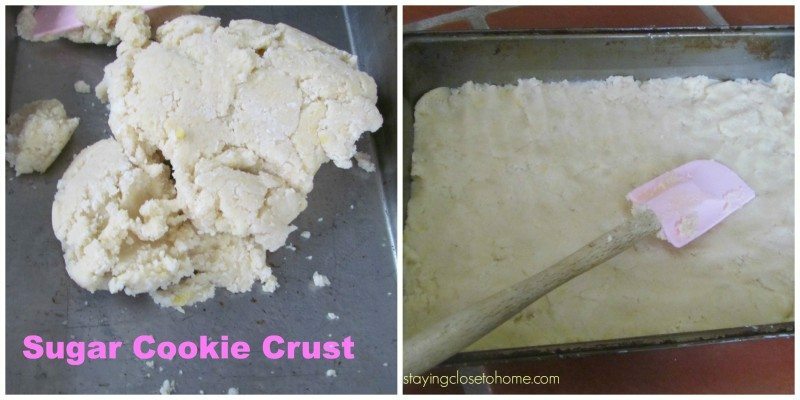 thanks Julie, they are super easy to make and I will mix up the cookie layer next time too. 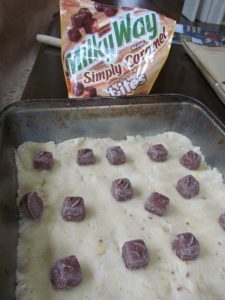 The Salted Caramel Bars look so delicious and I like the salty and sweet combination and this would be a great dessert for me to bring for my Family potluck and dessert for Easter. 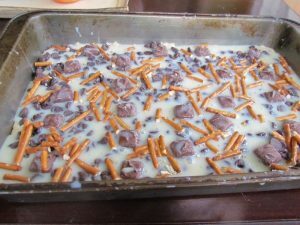 I think the recipe looks great! Thanks Brandi, it was a last minute Easter dessert idea but thought they turned out pretty cute. I love your chocolate ideas! I think the Salted Caramel Bars would be delicious. Everything looks so yummy and adorable! I know I would love the Salted Caramel Bars, my kids would love the little bunnies! Thanks Rose I will have to make more closer to easter! these are super easy too, definitely line the pan for easy removal. thanks I think they would be even more amazing with a choc. chip cookie or peanut butter cookie crust. Those salted Caramel bars look amazing!!! 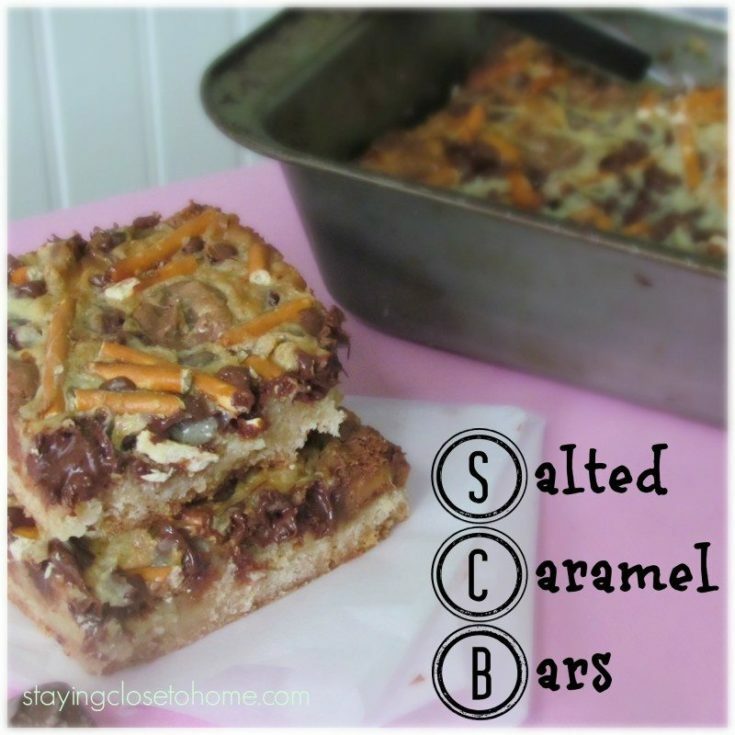 OMGoodness…I am Pinning those Salted Caramel Bars…I want to make that recipe! 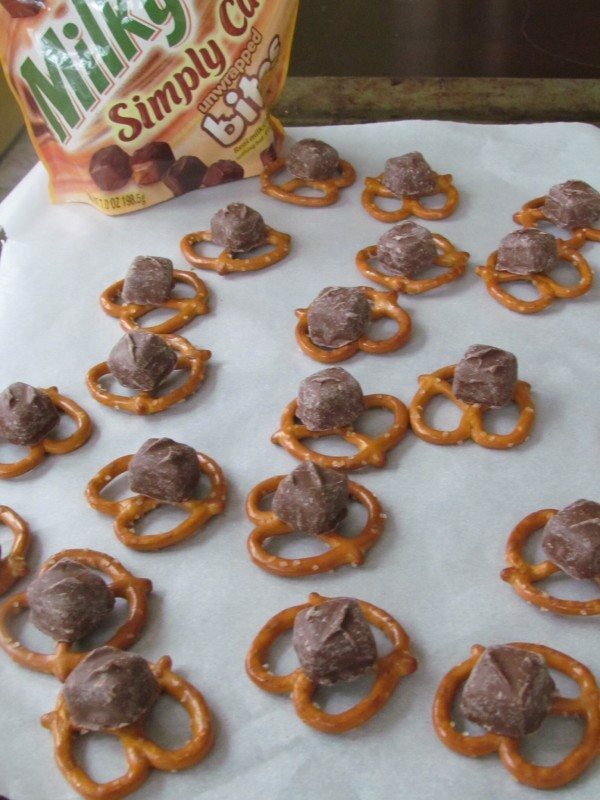 What a clever way to use Milky Way minis. I just love salted caramel bars! I have never made them though, but now I have a recipe so I can! 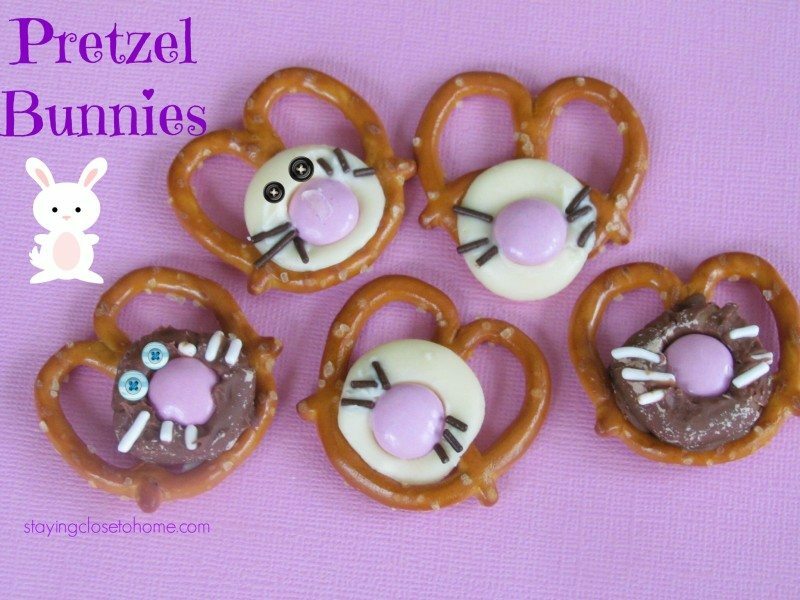 Those pretzel bunnies are absolutely adorable!!! !